When I moved to Chicago in August 2008, it was after having lived at home with my parents for the summer. I've always been fiercely independent, so spending more than a week or two at home is challenging for me - I don't drive and my parents' house is pretty small, so there's no freedom and little privacy. Those three months were rough, but the light at the end of the tunnel was moving to Chicago and starting a new chapter of my adult life. 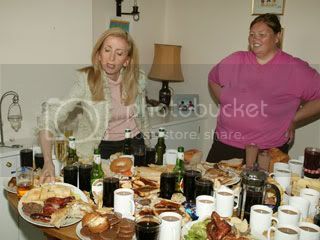 Despite not being a television watcher, that summer, one show I made sure to watch every day was a BBC reality-type show called "You Are What You Eat," where this woman (Gillian McKeith) would go into people's homes and try to help them eat better and get more active. One particularly striking thing Gillian would do was to monitor what people ate for a week, then lay it all out on a table for them to see. It was shocking. And gross! And it made me really reevaluate what I was putting into my body. And so, when I got myself set up in Chicago, I had been so moved by this show that losing weight was easy. I didn't want my "table" to be covered in fried junk and soda pop. This past August when I first started this blog and tried starting to get healthy again, I wanted to recapture the momentum I felt after seeing "You Are What You Eat." So I sought out documentaries - some about healthy food, some about exercise, some about obesity. And it worked. I watched them and took notes. I blogged about them. I felt so inspired by these documentaries, and I was ready to have a success story of my own. Since I've been in the most roller-coaster-y of moods lately, I decided to look around Netflix last night to see what was new, what else could inspire me. 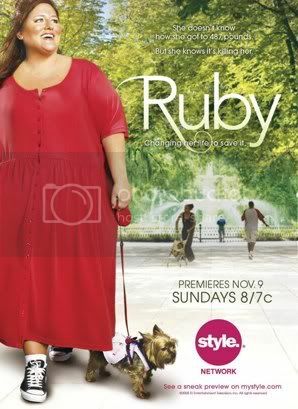 I ended up finding the first two seasons of a show from the Style Network called "Ruby." It's a reality show about a woman who weighs nearly 500 pounds (but was over 700 at her highest) and who is trying to reverse her death sentence by losing weight. I watched the first couple of episodes, and I cried an awful lot. There were a lot of feelings, I guess, and crying just seemed to help deal with them all. I was proud of Ruby for not giving in and accepting the restricted life she had been living. I was happy for her being so positive and living her life as best she could given her physical restrictions. I was empathetic when she didn't want to eat well or didn't want to push herself to do exercises. I was heartbroken when she talked about a man she loved very much who basically gave her the ultimatum of losing weight and marrying him or staying obese and him leaving, and she felt so out of control that the latter seemed to choose her. (I was also very glad that when this man came back into her life, she stood firm in letting him know that she was not interested in someone who loved her only under certain conditions.) And I was very jealous of her support system - she has friends and family around her at all times to help her stay on track and stay motivated. One of the steps Ruby is taking to help her along her journey is to have a whole team of experts guiding her - a general doctor, an obesity speciality, a physical trainer, a nutritionist, and a psychiatrist. While speaking with her psychiatrist, the subject of fear came up quite a bit. Her fears and anxieties controlled many of her decisions, and the doctor explained that becoming aware of her fears would help loosen their control over her. She will have to shine a light in all the dark places where she's been hiding her secrets and fears. She came away from the meeting understanding that the weight loss journey is not just about food and exercise - there is a mental component that, at times, can be even harder than the dietary changes. It got me thinking a lot about my own mental blocks this past week, and how they relate to fear. With all my focus on "only" losing one pound this week, I had completely overlooked reaching my third mini-goal. 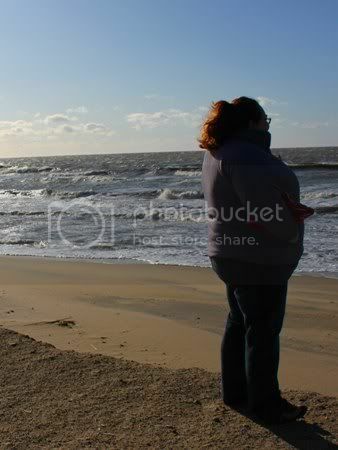 I now weigh less than I did in October 2008, the last time I seriously tried losing weight. Which makes this my lowest weight in about six or seven years. And yet, I still find myself stalling. What am I afraid of? To be completely honest, I'm afraid of a lot of things. Terrified, even. I am venturing into the unknown. I've never been a thin person. Even as a kid, I was always a little bigger than everyone else. And even though my long-term goal weight is still 161 pounds away, I'm fearful of having to live a life I never thought possible. I've used my weight as a crutch for so long. It's been my armor - as long as I was obese, I didn't have to deal with the things most people my age were dealing with. Finally getting exposed to the world? Beyond frightening. There are the recurring dreams and fantasies about shopping for clothes wherever I want, about going out and not worrying about breaking chairs, about not dreading getting my picture taken - but those have always been just that: fantasies. The thought of dreams coming true has never been real to me, and so, I'm afraid. So many of my unsuccessful attempts to get healthy in the past can be attributed to focusing only on numeric long-term goals, so this time I have broken the numbers into smaller victories. Now, I am realizing that I need to do the same with mental and non-scale goals. Mary, I have had the same thoughts! I haven't been thin since I was 8 when nothing matters besides how long you can play before dinner! I don't know how to be thin and it scares me! But we will all make it through together! I think what you are doing is fantastic. You are not just focusing on food and exercise, and numbers on a scale. But you realize that the most important part of this is the MENTAL aspect. And you are asking questions, and being honest with yourself. I've had to do all that...still am, in fact. It's like peeling an onion. Layer by layer. It IS scary sometimes. But you are doing it, and that shows courage. Feel the feelings, keep going, you will be just fine. You really are doing wonderful, whether or not it feels that way! What an AMAZING post.... I know your fears well... A lot of my fears of failure keep me from trying. You are such an amazingly genuine and honest person. You deserve every mini goal broken through and the attainment of your major goals. Fight the fear miss... I know it's hard. I'm fighting it too... I think it's my biggest enemy. I'm here to support you. Even though I can't be there to walk with you... I will be in spirit. I am going to check out Ruby when I get a chance... thanks for posting it. Keep up the fight for what you are inside! Great Post!!!! Oh yea, put me down on the 'afraid' side too. I am not as afraid of losing the weight but of putting it all back on again. That is why I try to focus on changing the way I eat and look at food - I know tempatation will always be there taunting me...I just want to have the tools and be ready for it! This is a great post. I think so many of us have fears of how life will change when the weight is gone. You are doing an amazing job.